This post may contain affiliate links to products we recommend and personally use. If you purchase through these links, we earn a small commission to help sustain diaVerge.com & our advocacy work within the diabetes community, while not costing you any extra. Thanks for your support! When I started eating low carb nearly 2 years ago, there were a few thing I imagined I'd never eat again. As both my cooking skills and knowledge levels have evolved, I'm happy to say that nearly everything can be made using low carb ingredients. The other things I don't want anyway. Sometimes it takes some experimentation. Sometimes low carb recipes are not low enough for my preference, or they just don't work out quite as promised. This one, I am thrilled to report, is easy and unbelievably delicious. I've used a recipe that's been floating around some of the low carb groups and made it my own with a few simple additions. I'm happy to say this recipe is on weekly rotation in my house. It's that good. Spanakopita, the delicious greek dish, is traditionally wrapped in a thin, flaky phyllo dough. Cooked to a golden brown, the phyllo creates a crisp envelope around a creamy spinach filling. This Spanakopita can be a meal alone, or pair it with a greek salad, a few eggs cooked to your preference, or a piece of grilled chicken, fish or meat. *Trader Joe's 21 Seasoning Salute is HIGHLY recommended and contains onion, black pepper, celery seed, cayenne, parsley, basil, marjoram, bay leaf, oregano, thyme, savory, rosemary, cumin, mustard, coriander, garlic, carrot, orange peel, tomato granules, lemon juice powder, oil of lemon and citric acid. I love the complexity of flavor this adds. It's available at Trader Joe's for under $3.00 USD (per 2.2 oz/62 gram jar) as of this posting date. In a medium-sized non-stick saucepan or frying pan, add spinach and onion. Cook over medium heat, without lid and stirring frequently until completely thawed and heated through. Watch so it does not burn. Preheat oven to 400 degrees Fahrenheit (200 Celcius). While the spinach is cooking, prepare a rectangular baking dish (either one 9"x 13" or two 8"x 8" dishes. Metal, glass or ceramic baking dishes will all work, but I've had better results with glass and ceramic. Spray the baking dish(es) lightly with non-stick spray (or grease lightly with butter or oil of choice). Place cheese slices in greased baking dish(es), lining the sides and bottom of the baking dish. Set aside. Add cream cheese, eggs, feta, salt pepper and spices to drained spinach and stir thoroughly to combine. 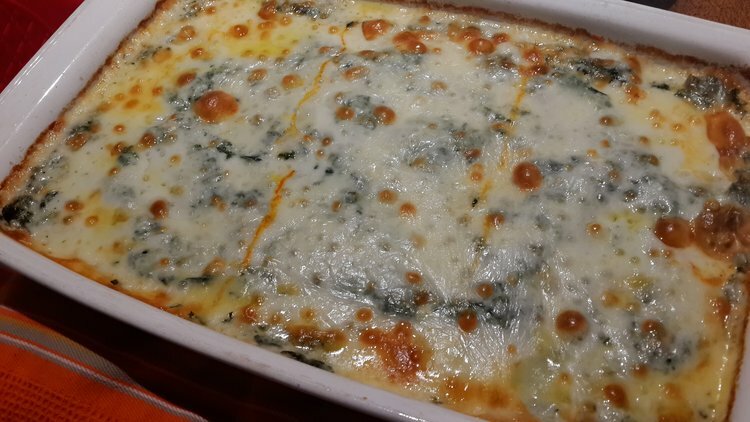 Gently add the spinach mixture on top of cheese slices in prepared baking pan, then spread the spinach to create an even layer and fill the corners of the baking dish(es). Layer additional muenster slices on top of spinach mixture, overlapping very slightly or just laid next to one another. They will melt to form an even "crust" upon cooking. You can fold down the sides, or leave them up. When cooking, they will melt to fill in the edges. Cook for approximately 20-25 minutes. It's done when cheese on top is melted and slightly golden brown. Allow to cool for 10 minutes and slice into large squares, approx 3"x 3". ** If you're interested in lowering the fat content, add the prepared spinach mixture directly into to a greased baking dish (without the initial layer of Muenster cheese slices). Then top the spinach mixture with a single layer of Muenster cheese slices and cook as directed. This requires only a portion of the cheese slices listed in the recipe but still have the same flavor. Have you tried this recipe? What were your results? Leave a comment below to tell us all about it! Sign up to receive new recipes, articles & updates from diaVerge Diabetes.